Daisetsu Teitaro Suzuki (鈴木 大拙 貞太郎 Suzuki Daisetsu Teitarō; he rendered his name "Daisetz" in 1894; 18 October 1870 – 12 July 1966) was a Japanese author of books and essays on Buddhism, Zen (Chan) and Shin that were instrumental in spreading interest in both Zen and Shin (and Far Eastern philosophy in general) to the West. Suzuki was also a prolific translator of Chinese, Japanese, and Sanskrit literature. Suzuki spent several lengthy stretches teaching or lecturing at Western universities, and devoted many years to a professorship at Ōtani University, a Japanese Buddhist school. He was nominated for the Nobel Peace Prize in 1963. D. T. Suzuki was born Teitarō Suzuki in Honda-machi, Kanazawa, Ishikawa Prefecture, the fourth son of physician Ryojun Suzuki. The Buddhist name Daisetsu, meaning "Great Humility", the kanji of which can also mean "Greatly Clumsy", was given to him by his Zen master Soen (or Soyen) Shaku. Although his birthplace no longer exists, a humble monument marks its location (a tree with a rock at its base). The samurai class into which Suzuki was born declined with the fall of feudalism, which forced Suzuki's mother, a Jōdo Shinshū Buddhist, to raise him in impoverished circumstances after his father died. When he became old enough to reflect on his fate in being born into this situation, he began to look for answers in various forms of religion. His naturally sharp and philosophical intellect found difficulty in accepting some of the cosmologies to which he was exposed. Suzuki lived and studied several years with the scholar Paul Carus. Suzuki was introduced to Carus by Soyen Shaku (also written Soen Shaku), who met him at the World Parliament of Religions held in Chicago in 1893. 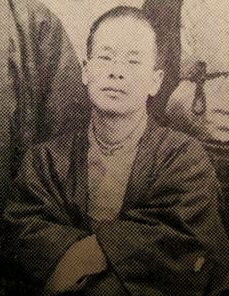 Carus, who had set up residence in LaSalle, Illinois, approached Soyen Shaku to request his help in translating and preparing Eastern spiritual literature for publication in the West. Soyen Shaku instead recommended his student Suzuki for the job. Suzuki lived at Dr. Carus's home, the Hegeler Carus Mansion, and worked with him, initially in translating the classic Tao Te Ching from ancient Chinese. In Illinois, Suzuki began his early work Outlines of Mahayana Buddhism. In 1911, Suzuki married Beatrice Erskine Lane, a Radcliffe graduate and Theosophist with multiple contacts with the Bahá'í Faith both in America and in Japan. Later Suzuki himself joined the Theosophical Society Adyar and was an active Theosophist. Hu Shi and DT Suzuki during his visit to China in 1934. Besides living in the United States, Suzuki traveled through Europe before taking up a professorship back in Japan. Suzuki and his wife dedicated themselves to spreading an understanding of Mahayana Buddhism. Until 1919 they lived in a cottage on the Engaku-ji grounds, then moved to Kyoto, where Suzuki began professorship at Ōtani University in 1921. While he was in Kyoto, he visited Dr. Hoseki Shin'ichi Hisamatsu, a famous Zen Buddhist scholar, and they discussed Zen Buddhism together at Shunkō-in temple in the Myōshin-ji temple complex. In 1921, the year he joined Ōtani University, he and his wife founded the Eastern Buddhist Society. The Society is focused on Mahayana Buddhism and offers lectures and seminars, and publishes a scholarly journal, The Eastern Buddhist. Suzuki maintained connections in the West and, for instance, delivered a paper at the World Congress of Faiths in 1936, at the University of London (he was an exchange professor during this year). Besides teaching about Zen practice and the history of Zen (Chan) Buddhism, Suzuki was an expert scholar on the related philosophy called, in Japanese, Kegon, which he thought of as the intellectual explication of Zen experience. Suzuki received numerous honors, including Japan's National Medal of Culture. Still a professor of Buddhist philosophy in the middle decades of the 20th century, Suzuki wrote some of the most celebrated introductions and overall examinations of Buddhism, and particularly of the Zen school. He went on a lecture tour of American universities in 1951, and taught at Columbia University from 1952 to 1957. Suzuki was especially interested in the formative centuries of this Buddhist tradition, in China. A lot of Suzuki's writings in English concern themselves with translations and discussions of bits of the Chan texts the Biyan Lu (Blue Cliff Record) and the Wumenguan (Mumonkan/Gateless Passage), which record the teaching styles and words of the classical Chinese masters. He was also interested in how this tradition, once imported into Japan, had influenced Japanese character and history, and wrote about it in English in Zen and Japanese Culture. Suzuki's reputation was secured in England prior to the U.S. In addition to his popularly oriented works, Suzuki wrote a translation of the Lankavatara Sutra and a commentary on its Sanskrit terminology. Later in his life he was a visiting professor at Columbia University. He looked in on the efforts of Saburō Hasegawa, Judith Tyberg, Alan Watts and the others who worked in the California Academy of Asian Studies (now known as the California Institute of Integral Studies), in San Francisco in the 1950s. In his later years, he began to explore the Jōdo Shinshū faith of his mother's upbringing, and gave guest lectures on Jōdo Shinshū Buddhism at the Buddhist Churches of America. D.T. Suzuki also produced an incomplete English translation of the Kyogyoshinsho, the magnum opus of Shinran, founder of the Jōdo Shinshū school. However, Suzuki did not attempt to popularize the Shin doctrine in the West, as he believed Zen was better suited to the Western preference for Eastern mysticism, though he is quoted as saying that Jōdo Shinshū Buddhism is the "most remarkable development of Mahayana Buddhism ever achieved in East Asia". Suzuki also took an interest in Christian mysticism and in some of the most significant mystics of the West, for example, Meister Eckhart, whom he compared with the Jōdo Shinshū followers called Myokonin. Suzuki was among the first to bring research on the Myokonin to audiences outside Japan as well. Other works include Essays in Zen Buddhism (three volumes), Studies in Zen Buddhism, and Manual of Zen Buddhism. Additionally, American philosopher William Barrett compiled many of Suzuki's articles and essays concerning Zen into a volume entitled Zen Buddhism. While studying at Tokyo University Suzuki took up Zen practice at Engaku-ji in Kamakura studying initially with Kosen Roshi. After Kosen's passing, Suzuki continued with Kosen's successor at Engaku-ji, Soyen Shaku. Under Soyen Shaku, Suzuki's studies were essentially internal and non-verbal, including long periods of sitting meditation (zazen). The task involved what Suzuki described as four years of mental, physical, moral, and intellectual struggle. During training periods at Engaku-ji, Suzuki lived a monk's life. He described this life and his own experience at Kamakura in his book The Training of the Zen Buddhist Monk. Suzuki characterized the facets of the training as: a life of humility; a life of labor; a life of service; a life of prayer and gratitude; and a life of meditation. Suzuki was invited by Soyen Shaku to visit the United States in the 1890s, and Suzuki acted as English-language translator for a book written by him (1906). Though Suzuki had by this point translated some ancient Asian texts into English (e.g. Awakening of Faith in the Mahayana), his role in translating and ghost-writing aspects of Soyen Shaku's book was more the beginning of Suzuki's career as a writer in English. Suzuki in his later years was not just a reporter of Zen, not just an expositor, but a significant contributor to the development of Zen and to its enrichment. ... in Dr. Suzuki's activities, Buddhism came to possess a forward-moving direction with a frontier spirit ... This involved shouldering the task of rethinking, restating and redoing traditional Buddhism to transmit it to Westerners as well as Easterners ... To accomplish this task it is necessary to be deeply engrossed in the tradition, and at the same time to grasp the longing and the way of thinking within the hearts of Westerners. From there, new possibilities should open up in the study of the Buddha Dharma which have yet to be found in Buddhist history ... Up to now this new Buddhist path has been blazed almost single-handedly by Dr. Suzuki. He did it on behalf of the whole Buddhist world. Essays in Zen Buddhism: Second Series (1933), New York: Samuel Weiser, Inc. 1953–1971. Edited by Christmas Humphreys. An Introduction to Zen Buddhism, Kyoto: Eastern Buddhist Soc. 1934. Republished with Foreword by C.G. Jung, London: Rider & Company, 1948. Suzuki calls this an "outline of Zen teaching." The Training of the Zen Buddhist Monk, Kyoto: Eastern Buddhist Soc. 1934. New York: University Books, 1959. This work covers a "description of the Meditation Hall and its life". Manual of Zen Buddhism, Kyoto: Eastern Buddhist Soc. 1935. London: Rider & Company, 1950, 1956. New York: Random House, 1960 and subsequent editions. A collection of Buddhist sutras, classic texts from the masters, icons & images, including the "Ten Ox-Herding Pictures". Suzuki writes that this work is to "inform the reader of the various literary materials relating to the monastic life...what the Zen monk reads before the Buddha in his daily service, where his thoughts move in his leisure hours, and what objects of worship he has in the different quarters of his institution." Mysticism: Christian and Buddhist: The Eastern and Western Way, Macmillan, 1957. "A study of the qualities Meister Eckhart shares with Zen and Shin Buddhism". Includes translation of myokonin Saichi's poems. Zen Buddhism and Psychoanalysis, Erich Fromm, D. T. Suzuki, and De Martino. Approximately one third of this book is a long discussion by Suzuki that gives a Buddhist analysis of the mind, its levels, and the methodology of extending awareness beyond the merely discursive level of thought. In producing this analysis, Suzuki gives a theoretical explanation for many of the swordsmanship teaching stories in Zen and Japanese Culture that otherwise would seem to involve mental telepathy, extrasensory perception, etc. An anthology of his work until the mid-1950s: Zen Buddhism: Selected Writings of D. T. Suzuki, Doubleday, New York: 1956. Edited by William Barrett. Very early work on Western mystic-philosopher.Swedenborg: Buddha of the North, West Chester, Pa: Swedenborg Foundation, 1996. Trans. by Andrew Bernstein of Swedenborugu, 1913. Transcription of talks on Shin Buddhism.Buddha of Infinite Light. Boston: Shambhala Publications, 1998. Edited by Taitetsu Unno. 'Tribute; anthology of essays by great thinkers. D. T. Suzuki: A Zen Life Remembered. Wheatherhill, 1986. Reprinted by Shambhala Publications. See also the works of Alan Watts, Paul Reps et al. Wikimedia Commons has media related to Daisetsu Teitarō Suzuki. Description: A documentary about D.T. Suzuki (1870-1966), credited with introducing Zen Buddhism to the West. Andreasen, Esben (1998). Popular Buddhism in Japan: Shin Buddhist Religion & Culture. University of Hawaii Press. ISBN 0-8248-2028-2. Fields, Rick (1992). How the Swans Came to the Lake: A Narrative History of Buddhism in America. Shambhala Publications. ISBN 0-87773-631-6. Stirling, Isabel (2006). Zen Pioneer: The Life & Works of Ruth Fuller Sasaki. Shoemaker & Hoard. ISBN 978-1-59376-110-3. Victoria, Brian Daizen (2010). "The "Negative Side" of D. T. Suzuki's Relationship to War" (PDF). The Eastern Buddhist. 41 (2): 97–138. Archived from the original (PDF) on 29 November 2014. ↑ 4.0 4.1 Fields 1992, pg. 138. ↑ The Eastern Buddhist Archived 18 December 2008 at the Wayback Machine. ↑ D.T. Suzuki The Training of the Zen Buddhist Monk. New York: University Books. 1965. ↑ 16.0 16.1 16.2 Suzuki, D. T. (1978). Manual of Zen Buddhism. Random House. p. 11. This article includes content from D. T. Suzuki on Wikipedia (view authors). License under CC BY-SA 3.0.